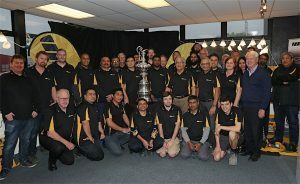 The America’s Cup made a brief appearance at an Onehunga CNC machining and composite engineering facility last week, accompanied by members of Emirates Team New Zealand who’d come to extend a big thank-you. Jackson Industries and Emirates Team New Zealand’s onsite build team, lead by Paul Quinn, produced the precision carbon-fibre foils for the high-flying catamaran which defeated Oracle Team USA 7 – 1 in Bermuda to bring the Auld Mug back to New Zealand. As one of the most crucial components on the catamaran, he added, manufacturing the foils demanded high-spec moulds and tooling, high-tech composite engineering – and finally, precision machining of the foils. Regan also acknowledged the significance of Emirates Team New Zealand’s victory for New Zealand industry, and believed it heralded a particular boost for the country’s marine industry. Managing director Jim Jackson said the company has been involved with Emirates Team New Zealand for some 16 years, and had contributed to the development of the AC72 catamaran for the 2013 event in San Francisco. “This year’s event with the AC50 was very different – not only because the timeframe was so tight, but also because the design and technology of the boats had advanced enormously. We were forced to up our game and invest in higher-spec machinery – and our composite engineering expertise was pushed into uncharted territory – let’s just call it a fairly steep learning curve! Each of the AC50’s foils comprise 400 layers of carbon-fibre. To achieve the right density/structural integrity, the layers are cured in stage in ovens and auto-claves. Each foil took around three months to build, and two processes were involved in achieving the required accuracy, says the Jackson’s project manager, Paul Flett. “The first is producing the tooling – the female mould – and the second is machining the actual foil’s upper surface. Machining carbon-fibre, he adds, isn’t easy. “Carbon is very hard and conventional cutting heads wouldn’t work, particularly on the high-density foils. A conventional cutting head would rip the fibre apart and splinter the surface. Jackson also machined other carbon-fibre tooling and components for Emirates Team New Zealand’s boat, including the radical pedal-power bikes. For more information contact Nina Wiebel at 09 634 3376 or email nina@jackson.co.nz.